We’ll talk about Cayde’s death and the Destiny 2: Forsaken story in a bit. I have thoughts on that. I have a lot of thoughts on that. I have a number of things I want to say, theories I want to ruminate on, and rants I want to make. In short, I think it is an amazing–albeit quite emotional–direction Bungie has decided to take the story, but that’s not what I want to go over here. While I did get to experience a small part of the campaign, I was first treated to a few rounds of Destiny 2’s upcoming PvP/PvE hybrid mode, Gambit. If there’s one word to describe Destiny 2’s unique new mode, it’s “frantic.” There’s a risk and reward to every single moment and decision within Gambit, and it will keep you on your toes. If you haven’t yet heard how Gambit works, it initially functions like a kind of horde mode. Two teams of four guardians are sent into their own arenas full of enemies to fight, and killing them will drop motes. Banking those motes in the central bank device–which seems to be swirling with Taken energy–is the goal for a number of reasons. Banking a certain number of motes at one time will summon a blocker Taken enemy for the opposing team, with its size and difficulty dependent on the number of motes banked at once. At this point, the bank descends into the ground and the Taken blocker enemy must be killed before it returns. During this time, precious motes can easily go to waste if you get killed, because any motes you are carrying are entirely lost upon death. 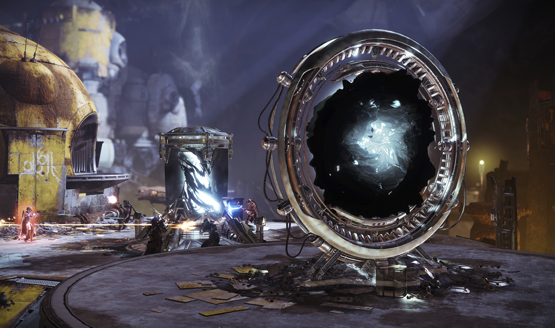 Bank a total of 25 motes and a portal will open, allowing one player to go to the other side to fight the enemy team. Get 75 and the boss spawns. The first team to defeat their boss wins. It seems relatively straightforward, but there is an intense amount of strategy involved in every moment of a Gambit match. The word “gambit” immediately calls to mind a gamble–a sense of risk and reward–based on a series of calculated decisions and moments throughout each match. Competition breeds ingenuity, recklessness, and heroic moments that all come together to form the backbone of Gambit’s experience. Do you rush for those motes lying on the ground, only to risk losing what you have? Do you spend time reaching the 15 mote cap before returning to your bank to find a blocker? Do you grab motes that your teammate could have grabbed to call a bigger blocker on your opponents? And that’s all not even considering moving through the portal to take on the enemy team. When the gambit pays off, it feels like sweet victory. When that move results in a loss, there’s a momentary lesson to be learned, even if you’ll be back rolling the dice and playing on those very same gables again within moments. There’s a little bit of everything in Gambit. You can lead the assault on the waves of enemies. You can focus on collecting motes. You can clear blockers for the rest of the team. You can invade the enemy team’s arena. The boss round continues to add a special flavor in a sort of “last chance” mechanic. By killing the opposing team, you can actually regenerate their boss’s health, in turn giving your team some extra time to work with. They can do the same to you however, so being aware of invaders is a crucial skill. If you’re behind do you focus on pushing the charge to the enemies faster, or do you take the risk of assaulting the enemy team in the midst of their boss encounter? Gambit is all about weighing the risks and rewards of every single moment in the game. Low-risk plays might payoff more often, but they won’t result in nearly as high a reward as the high-risk plays that have a much greater chance of failure. The mysterious Drifter is the proprietor of the Gambit arenas, and his ship is actually the staging area for the event. In talking with the team behind Gambit, there is a very significant lore reason for The Drifter to be in the Tower and hold these tournaments. He will be the vendor for the mode, much like Shaxx is for Crucible or Lord Zavala is for Strikes (or Cayde-6 is for Flashpoints, sniffle). “There is some deep lore and backstory for his character,” Lars Baaken told me. “He will start to reveal himself and why he’s doing this in the first place slowly over time,” They are leaving much of that lore as a surprise for players in September though, so I wasn’t able to glean much more information about how it fits into the narrative of Forsaken. “He’s going to have bounties, he’s going to be tied to a bunch of different things. You are going to learn even more through the story,” Scott Taylor chimed in. There will be an introductory experience that leads players to him for the first time, where The Drifter will then invite the Guardians to join him in this thing that he is doing. “He has his own agenda. You’re going to learn about his affiliations and what he’s interested in, and why he’s doing what he’s doing,” Taylor continued, indicating that The Drifter and Gambit will definitely feel like they fit in as a piece of what Destiny 2 and Forsaken are. 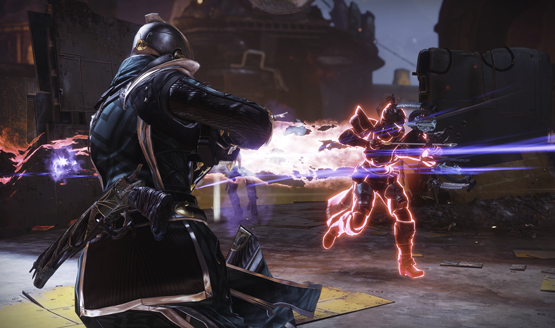 At launch, there will be four different environments that Gambit can be played in, along with variations on those environments depending on which enemy race is spawning. Gambit is a mode that’s been toyed with and iterated on for more than a year, so there’s a certain level of confidence in this public build that they are finally showing. As with anything else in Destiny 2, the team eagerly awaits feedback from players to allow for even more iteration based on what’s being received well and what some of those critical points might be. From my first impressions, however, I would say that the year’s worth of iteration has gone a long way in making Gambit feel really clean, balanced, and most of all, fun. Gambit is a mode full of intensity and decision making unlike Destiny has ever had before. In fact, I would be hard pressed to think of any other game that has kept me so incredibly engaged in the moment to moment minutia, be it killing enemies, traversing the environment, or engaging in direct combat with other human players. No two matches will be alike, and different teams will adopt different strategies to take it on. Not only is the mode itself great, but it joins a host of other great changes and content coming to Destiny 2 that all really allow Gambit to cement itself as a core part of the Destiny 2 experience going forward. For a brand new mode to feel so ingrained in that way, it really proves that Gambit has shown its mettle far beyond what its exterior might suggest.